Harvester are currently encouraging families to spend more time together around the table in an effort to get the feel good factor back into family time. 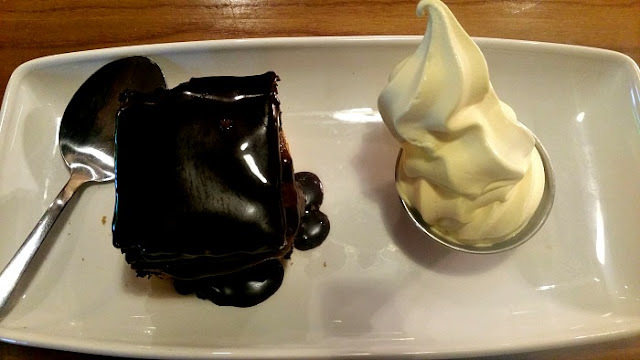 To celebrate we went to the Harvester at Meridian Leisure park in Leicester as a family to sample the menu and review our experience. On first impressions, the location is great, set amongst a cinema and bowling venue, it is already a prime location for some valuable family time. We were greeted by a very friendly girl who led us to our table. She took our drinks order straight away and gave us time to choose what we wanted to eat. 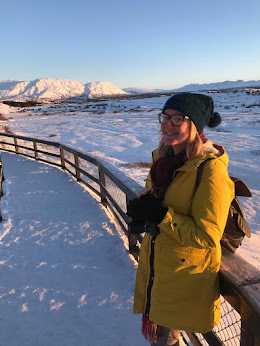 We were asked three times if we were ready to order (in a polite not pushy way) and were given plenty of time to decide. Once we decided what we wanted we were told to help ourselves at the unlimited salad bar. This is great for when you are feeling hungry and dreading the wait for food. There was a good selection available at the salad bar with plenty of everything and it all looked nice and fresh. Luckily we didn't need to wait long at all for our food, in fact I had only just finished eating my salad. After looking at the tasty chicken options and really struggling with what to choose, I went for the Triple Chicken with a bit of everything! 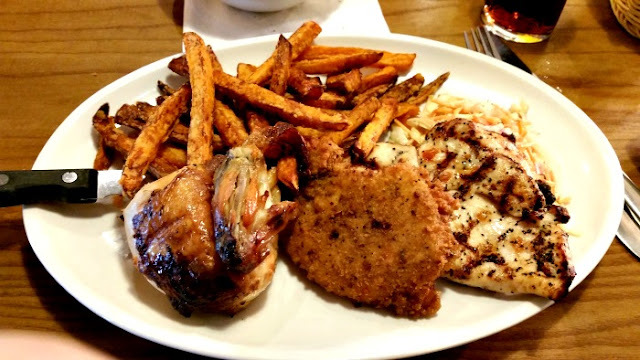 A chargrilled chicken breast, 1/4 rotisserie chicken and a southern fried chicken breast which came with Harvester coleslaw and a side of your choice. I added sweet potato fries which you can get for an extra 50p. I was so impressed with this meal! It was so tasty, each different kind of chicken was cooked to perfection and the sweet potato fries were yummy. This meal was £9.99 plus an extra 50p for the sweet potato fries. 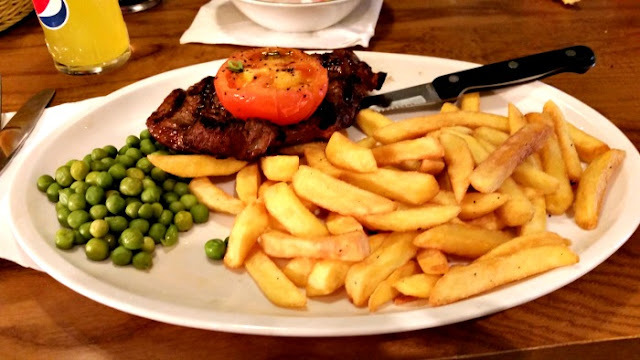 Andy went for the 8oz Sirloin Steak, medium/well done with chips and peas. The steak was well cooked exactly how he likes it. The meat was good quality and not full of fat which is always good. The portion size was perfect for him and he thoroughly enjoyed the meal. This meal cost £13.49, a good price for a decent quality steak. The kids were quite hungry so we opted for the bigger appetite meals on the kids menu. Gracie chose a Chicken Burger served with mash and beans. Zach opted for Southern Fried Chicken with chips and peas. These were perfect child sized portions and both looked really nice. The kids seemed to enjoy them anyway although I think they had stuffed themselves with salad first as they struggled to eat much of it whereas they don't usually eat starters. They had a good go though. Both children's meals were £4.59 each. Me and Andy decided to have a dessert each after our meal. Andy chose an ice cream sundae with raspberry sauce and I chose Cookie Dough, Caramel & Chocolate Fudge Brownie Stack. I was a little disappointed with mine. The cookie dough tasted more cakey than doughy and there wasn't much caramel, the fudge brownie was delicious though. It was still nice and I ate all of it, it just wasn't quite as good as it sounded. Andy's ice cream sundae was £3.59 and my Cookie Dough, Caramel & Chocolate Fudge Brownie Stack was £4.29. 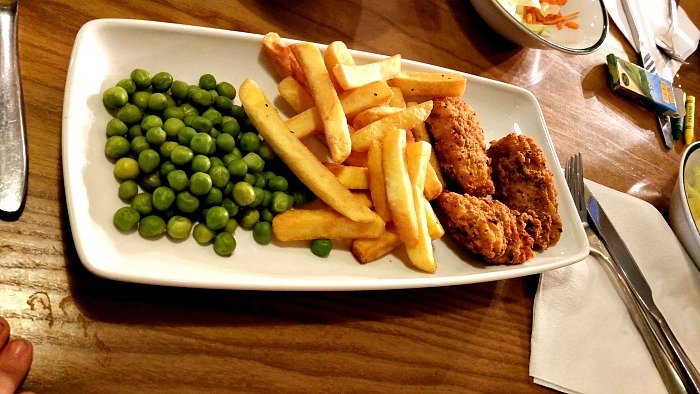 The whole meal including drinks, desserts and a side order of chips came to just under £50. With the drinks (soft drinks) and salad both being unlimited you will leave satisfied. Little touches like colour in children's menus keep young children occupied whilst waiting for dinner. 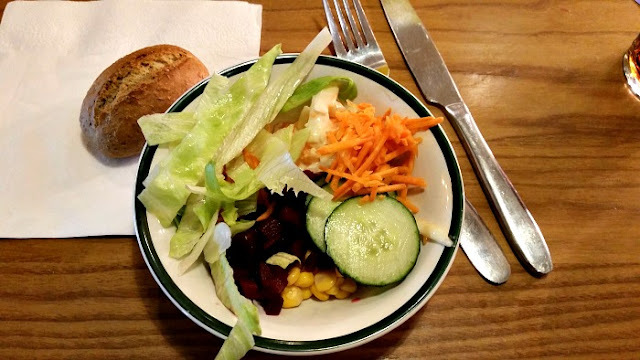 The Harvester at Meridian Park, Leicester is a great one to visit. The service was great, the staff were all very polite and friendly. The toilets were very modern, clean and completely private as each toilet was in it's own small room with a sink like a personal home toilet. We would definitely return. It was lovely to spend a few hours together talking and eating good food. We love to eat together as a family and talk about our day at the same time! We received complimentary meal and drinks in return for an honest review. All opinions are my own.